Princess Madelyn is always disobeying her parents and going out to hunt in the early morning, out in the forest, out in the world, surrounded by danger. After a while, they decide to try desperate measures, and ask Gilan for help. But Gilan, the new commander of the rangers in the kingdom of Arualen, has come to them, the king and queen, asking for help. Will Treaty, the most well known ranger in the kingdom of Arualen, has devoted himself to finding the man responsible for the death of someone very dear to him. Halt, Will’s mentor, is also present, and he comes up with an idea that could kill two birds with one stone. As a result, Madelyn is signed on to Will as his apprentice, and the very first female ranger in the ranger corps. She goes through hours of training every day, and a farmer comes to them for help. Will and Madelyn have to find someone or something that is stealing the farmer’s eggs. It turns out to be an animal, which Madelyn kills with her sling. Later on, Will and Madelyn are called on to investigate the death of a ranger in a neighboring fief. As the two uncover more and more evidence, the clues lead the two back to Will’s original vendetta, which was against the man who killed his wife. When I first opened the book, I thought that it would be quite enjoyable. Having read all the other books, I thought I would know what the book was about. But the ending turned out to be a complete surprise. I thought that after I read a few pages, I would become bored and put off reading it until the last few days. 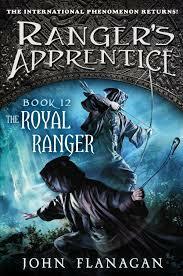 But after I found out who Will’s apprentice was, I was completely intrigued. I think that the author used excellent word choice, because a lot of the words I saw throughout the course of the book were words that we learned in class. Even so, there were some words that I could not quite understand, and that was the only weakness of the book that I could find. One of the strengths was that the author captures your attention from the very beginning by giving away some but not all of the fascinating information in the story. I would recommend this book for seventh through ninth grade, and rate it nine out of ten stars. 2. Who is commander of the rangers? 2a. Following commander Crowley’s death, the rangers appointed Gilan as commander of the rangers. 3. Appointing the princess as Will’s apprentice solves which two problems? 3a. Appointing the princess as Will’s apprentice solves Will’s problem dealing with Alyss’s death. It also solves Madelyn’s immaturity problem. 4. How did Will find out that Madelyn had run off to a party with her friends? 4a. He found out because she had taken her cloak. 5. What is the code to ride Madelyn’s ranger horse? 6. What was Maddie and Will’s first mission together? 6a. Their first mission was to eliminate an egg thief, which turned out to be an animal. 7. What was Maddie’s role in the villages she and Will visited? 8. Who does The Stealer send to scare Maddie? 8a. The Stealer sends Benito, a retired Iberian soldier. 9. What does Maddie do when she is not with the village children? 9a. She helped clean dishes in the inn, and also served as a waitress. 10. What weapon does Benito use to try and kill Maddie? 10a. Benito used quattros, and Iberian weapon. 11. What did Jerome tell Will after Will returned to the village? 11a. Jerome told Will about the dead man they had found outside the inn. 12. What did Will find out about Violet Carter, who was the girl that the Stealer would probably take? anger out on their daughter. 13. From where did the kidnappers enter the village? 13a. They entered the village coming from somewhere behind Will, who was hiding in the bushes. 14. How did Will start the attack on the slave traders after he discovered their camp? 14a. He started the attack by shooting fire arrows at the ship. 15. How long had Madelyn trained before she received the bronze oakleaf? 15a. She had trained nine months, rangers usually trained twelve.